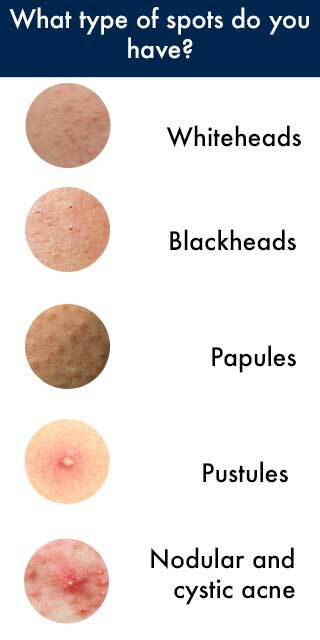 What type of spots do you have? With all spots and acne the root cause is an excessive buildup of sebum and oil which cause the pore to become blocked and bacteria to form. This results with the spot appearing from underneath the skin. However if you have suffered with spots or Acne then you’ll have noticed that they don’t always come up the same way! Some can be painful and angry looking while others seem to come and go quite easily! Knowing what type of spots you have can help you figure out how to treat them and why you have them! Whiteheads are probably the most common form of spots. Easy to see and had to cover! Whiteheads show up as small white spots- most commonly around the mouth and forehead. These are closed spots on top of the skin that seem to be a favourite for pimple poppers! Do not burst these as it can easily lead to scarring. Blackheads are formed the same way as whiteheads – by a clogging of the pore. However the only difference with a black head is the the pore is not fully clogged like a white head. As it is not clogged fully air may get in which oxidizes and causes it black colour! Blackheads and whiteheads are known as ‘Superficial Acne’ meaning they are only the topmost layers of skin. Acne can go deeper in the skin – of course this acne is much more troublesome and hard to treat compared to the superficial Acne! When the pores get irritated their walls break! That causes bigger pimples that are called papules and pustules. Papules are hard when you touch them and appear as small bumps on the face surrounded by inflammation. Pustules are just like papules except filled with a yellowish pus that may look like a blister. These tend to be the famous pimple popper videos!. When you have a cluster of papules or Pustules together it can be very painful and irritated. Unlike whiteheads, cysts are formed underneath the skin . white cells, oils and fluids build up causing the appearance of pus pushing under up under the skin. Cystic spots are usually inflamed and can be very painful. Most commonly on the chin and face they can also appear on the back, shoulders and arms. Nodules are the large, hard, painful bumps that appear under the skin surface during the later stages of acne breakouts. They are caused by the hair follicle breaking off under the skin and clogging the pore. With Nodules it is essential that they are treated early as they are likely to scar. They can also lay dormant in the skin without ever really being healed and cause tissue damage. When should I see a Skin Health Specialist? Do you have Spots or Acne you want taken care of? Book in with our Skin Health Specialist now!